Stylish waterfall style side, wrap around side with toning accents and a warm cream colored dial and airplane style pointer. What a beautiful design! Look at the dial glowing in the dark, it kind of warms you up. Beautiful radio design, as you'd expect from Detrola. The cabinet has been refinished using the very finest toning and finishing lacquers, producing a gorgeous luster. The dial cover is nice and clear. 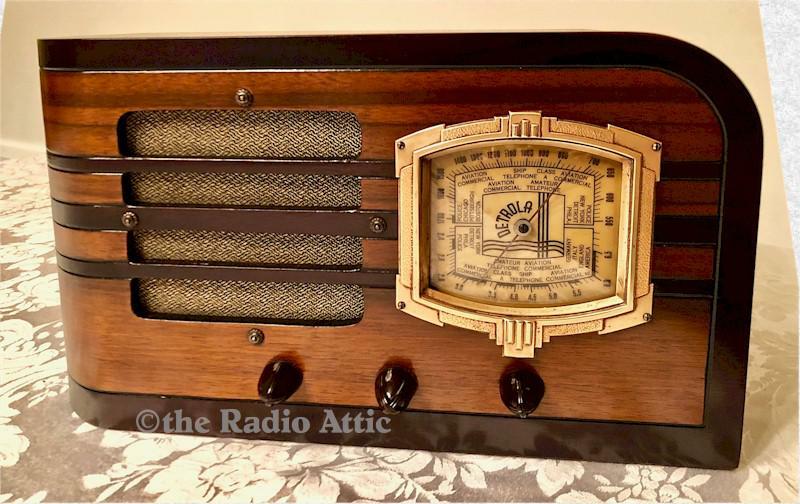 The electronics have been completely restored (no shortcut repairs, internally fused for your safety and has a new polarized power cord), and it plays very nicely on both the AM broadcast band and the shortwave band. A four-tube set that originally had the dangerous "curtain burner" resistor line cord but replaced with safe, modern components. 13-1/2"W x 8"H x 6-1/2"D.